Two of Aberdeen's most popular poets are featured in a venue that can justifiably lay claim to be the nerve centre of poetry in the city. Not only has Books and Beans hosted regular monthly poetry gatherings since 2003 with only a few breaks, but it is also a popular place for poets to meet informally. 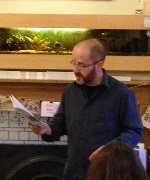 It is a great pleasure then to see an enthusiastic audience gathered to witness the launch of the debut poetry collection from Richie Brown, a relative newcomer to the Aberdeen poetry scene, but who has done much in a short time to support the writing of others. Richie's own writing is witty and entertaining, often topical, satirical and deeply touching by turns. Chancellor George Osborne gifts the subject matter of the opening poem, A Budget for Beer Drinkers, in which, following a budget reduction in tax on beer, Richie imagines meeting up with Osborne and accompanying him on an Aberdeen drinking binge. Celebrity culture, government surveillance and Facebook are laid bare to the audience's mirth in Hello to Big Brother, but there's a sudden turn to the serious in The Gunman, in which the poet suggests that the media publicity frenzy surrounding the perpetrators of mass shootings could well inspire copycat behaviour. Childhood yearnings for Scarborough, fuelled by 1980s TV, are deflated when Richie visits the place for real as an adult and recounts the tale in verse, then in Where were you when? he imagines what his ancestors were doing at key moments in history. So far everything has been delivered in the flowing metre and satisfying rhyme of which Richie is such a master, but when he invites fellow poet Gerard Rochford on stage to deliver the collaborative two-hander they wrote for the recent Auld Enemies project, we find that Richie can hold his audience just as convincingly when liberated from his rhyme-jacket. Next Richie introduces his support act, the poet Mark Pithie, dubbed the "poet of disappearing Aberdeen", a long-established figure on the local literary scene. Mark begins by reading from his now legendary chapbook Back Wynd of the Mind, in which we meet familiar folk on the streets and in the shops, pubs and clubs of Aberdeen going about their daily and nightly existence as the poet rails against the changing times. The sense of identification is tangible in the audience as they recognise their city, and perhaps themselves, in the verse. 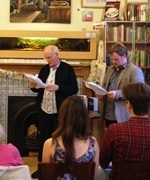 Mark then turns to a sequence remembering his recently deceased father, which may feature in his forthcoming collection. The tribute is warm and the recollections are delightful in their detail – as a child Mark is warned of the risk of "plasticated lungs" as he throws a plastic bottle on the fire. 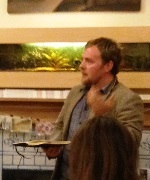 There is a short interlude in which members of the audience are invited to contribute their own poems. These range widely in tone, from a thoughtful homage to a lost brother from a young newcomer to the local poetry scene, to a frankly zany piece about shags and bags from veteran Brian Farrington. Mark Pithie returns for a second set, dedicating a piece about the excesses of Christmas shopping to a well-known Christmas loather in the audience, recounting a lecture by Lisa Collinson about the meaning of Hamlet, plugging his new music blog in a poem inspired by Eric Dolphy, and finishing with a piece written for a trade union gathering, echoing Adrian Mitchell – "tell me lies about the cuts!" Richie Brown delivers the closing set, beginning with an unpublished poem from the little black book in which his newest thoughts come to fruition. This is another response to a George Osborne budget, now favouring bingo, so Richie leads us off to the bingo hall where Osborne is the caller, announcing the numbers with mischievously forced rhymes that have the audience in stitches. We return to the book for Inevitably, a modern little fable of boys who never grow up. We watch TV news headlines with Richie in the gym, and meet the drummer who can count to three. One poem invokes Pam Ayres, as Richie's mentor Eddie Gibbons says one poem in any collection should, and we are given a moment to ponder the gnomic One-upmanship. In Foggy Bummer Richie surrenders a springtime adventure in favour of watching TV when the fog descends, then his reading ends, as does the book, with the touching and rightly popular Dad's Last Dance. Travel with my Rants is a confident and impressive first collection, and Richie does it full justice in his characterful performance, making for a highly entertaining and enjoyable evening out. Do seek out the book! You won't be disappointed!